Take inventory of your electrical landscape. Locate all the reachable outlets and wires. You’ll find many dangers if you crawl around in every room like a small curious child. Evaluate electrical safety product options. Compare the pros and cons of various electrical safety solutions for your home. Block outlets with sliding plate covers. These covers are preferable to the plug in type, they may loosen, or fallout, and present a choking hazard. Sliding plate covers screw into the wall and you can plug and unplug appliances as needed. Conceal cords, there are many cable management products help keep wires as bundled, controlled and hidden as possible. This will help to protect against wire entanglements. Create an untangled, organized system using a mix of cable ties, wraps, covers and sleeves. Hide your surge proctors and avoid the shock hazard of open outlets by utilizing power safety covers. Unplug your electrical appliances when they are not in use. This is particularly important in bathrooms, especially with hair dryers, curlers and electric razors. Store them in a cabinet away from the water, with a safety lock, when they are not in use. Installing ground fault circuits will lessen the likelihood of electrical injury if an appliance falls into the sink. Always emphasize electrical safety and set a good example. 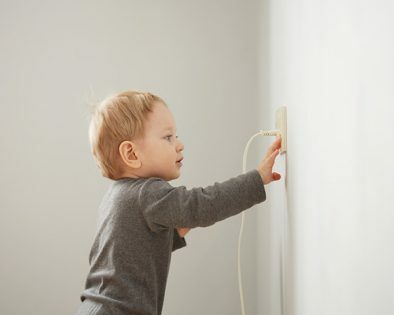 Babies will learn to stay away from loose wires and outlets if you are consistent and stern when necessary. Make sure toddlers understand to never touch, or stick fingers, pens, etc., into outlets.